[Copied from my goodreads account]: I rated this five stars. Full disclosure: Sarah is one of my best friends, and I archive her work at NIU. I absolutely loved this book. 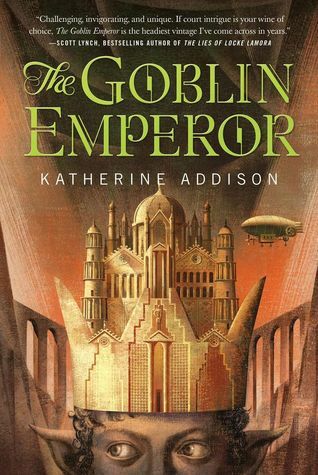 While the name Katherine Addison may be new to some readers, it is an open pseudonym for Sarah Monette, whose Doctrine of Labyrinths series (as well as pretty much the rest of her work, ever) I also adored. This is a standalone secondary world fantasy, with elves, goblins, and zeppelins. The naming system for the characters is a little on the complicated side (prefixes AND suffixes have meaning here), but rolling with it will get you where you need to be, and there’s a handy guide at the back of the book just in case. There is a zeppelin accident (this happens in the first chapter, so, not a spoiler but a precipitous event) that kills the Emperor and his sons. Maia is now the emperor. The rest of this book is an exquisite character study of Maia, who struggles to demonstrate goodness and kindness in a political and social system that is completely designed for him to be cruel and capricious and get away with it. If there is the opposite of grimdark, this might be it. Maia spend the entire book trying to figure out how to be an emperor *his* way. He is deeply sympathetic, and he absolutely struggles with the feelings that remain from his childhood abuse and the loss of his mother. How does a good person navigate in a system that is deeply corrupt? How do you find your friends and allies when you hold life and death power over everyone? Is it even possible to be kind? Good? Will people know what to do with it if you manage it? Will they *trust* it? As with all of Sarah’s work, this is beautifully written on a sentence level. More importantly, this is a deeply emotional story about good and evil and how and why we choose. Highly recommended, and this may be going on my 2015 Hugo ballot.